- First ~ 90 minutes of treatment on the floor. Two possible options: 1.) 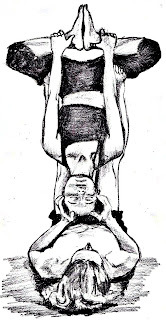 a deep, rhythmic, full body oil massage (Tulamassage), or 2.) the sacred dance of Thai Yoga Massage. - Followed by ~ 30 minutes in the air, floating in bliss on Marc's hands and feet. The positions generate deep healing as your body naturally unlocks, aligns and heals itself, suspended in reverse gravity... or floating horizontally in a meditative journey. Click here for a VIDEO preview. What I loved most about the tulayoga session was the way that the relaxation of the oil massage was used to deepen my experience of therapeutic flying. Combined with Marc's confident, absolutely trust-worthy basing, the massage enabled me to really surrender and melt--in the air! I felt transformed, slowed down, and profoundly refreshed. the massage felt very good, it helped me to come down, to arrive and come into contact. i was able to trust you and then to enjoy the flying. i dearly appreciated the coming back down on the earth, like a rebirth. The sequence of first working the muscles and then being lifted into air & relieving the spine from its usual gravitational pull was really powerful; after the session i felt both grounded and open-hearted, and my back seemed better aligned than before. Marc has a great way of establishing a container of trust and presence in which I found it very easy to relax, let go & surrender to the treatment. Once again, thanks a lot! Marc gave me a flying session.. savasana in the air - only better. I kept my eyes closed during almost the entire session. It felt like I was floating effortlessly on water: up and down, to the left and to the right. I felt completely secure throughout the entire session, even though I was amazed how Marc could hold me up with such ease and calm, floating in all directions. But when I opened my eyes to check where I was I realized that the big waves that I had been feeling had actually been tiny little movements. So I closed my eyes again to relax my mind and simply enjoy the rest of the session. Hours later I could still feel the floating movement and the openness the session had created in my hips. Amazing experience!